We had packed our bike boxes over the weekend and driven them and our bags down to Mike's office in the City so that we could go to work on Monday and then go directly from there to the airport. We left home in the morning and caught the bus and train to Osborne Park (me) and the city (Mike) - being careful not to get sweaty as I was actually wearing clothes that would be almost my entire wardrobe for the month! I left work around 4.30 pm and caught the train to the city and met Mike at work. We had a shower and went to get something to eat. We relaxed in the beautiful evening along the Swan River - aaah, let the holiday begin! It was super hot in Perth - dry and parched. Roll on NZ and cooler weather (if only we knew then what was in store!). Our flight to Melbourne was at 10.45 pm so we had arranged the airport shuttle pick up for about 7.45 pm from right outside the office. It was just a matter of lugging bike boxes and hold-all filled with panniers out to the road and we were collected and dropped if in no time. As always, getting to the airport, checking in and then collapsing are the order of the day! Our flight landed in Melbourne at 05.15 am. We managed a bit of shut eye on the plane which was good. Some time to kill at Melbourne airport before our 09.35 am flight to Christchurch. As always it's a little amazing just how many Aussies can put away jugs of beer at this hour of the day. We sat with all our bags and boxes on a bench, bit exhausted, watching a little sparrow and her baby. They had both managed to get inside the airport through the sliding doors and she was trying to get herself and baby outside again. This entailed going for the gap each time the doors swished open with foot traffic, but the baby could not get it right and refused to leave. She had to keep flying back in to try again. Small things amuse on airport transits. We arrived in Christchurch at 14.50 pm and passing through customs is always a lengthy process in New Zealand - very strict environmental controls. You unpack all your bags - they take your tent away and unpack it and scan it, you need to unpack the bikes so they can have a look at the tyres etc. We had cleaned everything really thoroughly and they were very happy. We were wearing our hiking boots and they check those too - many other travellers had to take their boots off which were taken away and sprayed and brought back dripping wet with who knows what, but if that's what it takes to keep this paradise what it, is it is worth it. We were in for an early night - always sleep like death on the first night! Lovely and cold and fresh...woken up in the middle of the night by a rustling amongst the packets and bags in the tent vestibule - I jumped up out of a dead sleep and ripped the tent door open to find a little hedgehog staring up at me! Only in New Zealand...too cute - he quickly burrowed away under the bags and disappeared into the night. We set the alarm as we had to catch the shuttle from Riccarton Mall at 7.30 am. We were up at 6 am and quickly packed in silence - the park has mainly permanents living in caravans - so didn't want to disturb. Everyone was so friendly. The park was just installing electronic entry gates and so on - so it's very safe and secure. We were a little confused about whether the Mall meant where Countdown was or further on at the Westfield's Mall. We ended up going to the Westfield's which was the right place. It was only 2 km's away. We had chosen this campsite because of it's proximity to the shuttle stop. The name of the company is Atomic Shuttles which we had had great service from a few years earlier. 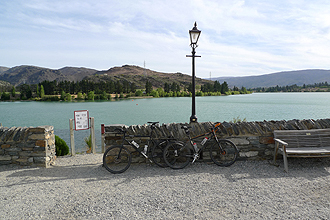 The cost of transport for us and two bikes and luggage was $90 from Christchurch to Queenstown (490 km) - what a bargain! 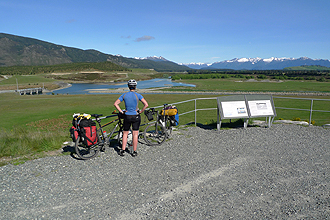 The trip itself was beautiful - we had planned our route initially to cycle back to Christchurch, so were very interested in the route the bus took through Geraldine, Fairlie, Lake Tekapo, Twizel, Omarama. Very beautiful scenery - the lakes an amazing glacial blue. We did note that the shoulders were narrow to non-existent and that the road was often very undulating. 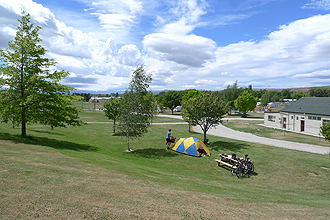 It is always fun to spot the campsite that you had planned to use for the return journey. It was a beautiful day's travel - lovely weather. 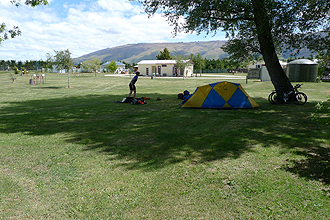 We arrived at Queenstown at 3 pm and it was only a 1 km ride up to our camp site at Lakeview Holiday Park. As usual Queenstown takes your breath away! Too beautiful. The last time we were there we had camped at Creekside and it was good to go somewhere different. Lakeview's facilities are excellent. Our plan was to spend two nights there, but when we booked in, we decided to stay for one only and to see what we felt like doing the next day. We were surprised to have to pay for the showers in such a professional outfit! 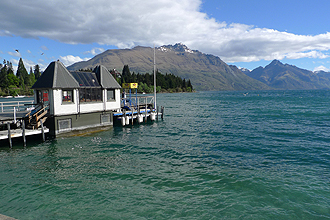 We went down to town - it's really a lovely place - the little harbour on Lake Wakatipu is just gorgeous. We bought amazing ice cream (look lets' just say that when in NZ ice cream better be fully explored as a food group!) from an ice creamery in town. We went back for more later that night! We went to the TSS Earnshaw booking office to find out what time the boat left each day but did not book in. There was room available for the next day although we were still planning on spending the day in Queenstown. 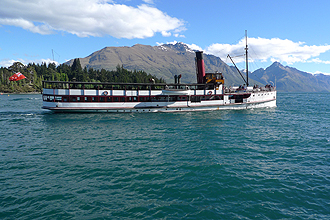 The TSS Earnshaw is an old coal-fired steam ship that takes tourists and locals from one side of Lake Wakatipu to the other - from Queenstown to Walter Peak Station which is a working sheep station that does tours of sheep shearing, sheep dog herding and so on. That evening we took a walk to the Queenstown Botanical Gardens also on the Lake Shore - there is a Frisbee course laid out and we came across a group having a game - it's like golf but with Frisbees! Still undecided about the next day, we collapsed into bed - the first time that we would not be setting the alarm! 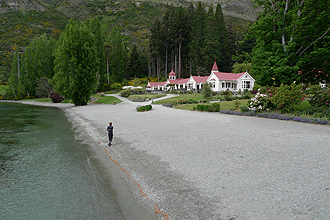 (1) Lakeview Holiday Park, Queenstown. (2) Queenstown. We woke up at 7.55! My immediate thought was - well the boat leaves at 10am so we will never make it - we still needed to get to the supermarket to buy supplies and get petrol for the stove...Mike said - "Plenty of time!" - we were packed by 8.50 and popped down the road to Fresh Choice - another huge supermarket - I went in and bought what we needed, Mike filled up the fuel bottle with petrol over the road and also put air in the tyres...we were set! Quick whiz down to the harbour - plenty of time! Bought tickets and then relaxed and waited. Most tourists go across and back to spend the day at Walter Peak - we bought one way tickets. I popped to the pharmacy to buy sand fly repellent. The trip over the water was amazing - freezing cold! You could stand inside and look over into the engine which was much warmer... who would have thought a few days ago in Perth we were so hot! The ship itself is really beautiful and the captain's commentary was humorous (emergency procedures - "in the event of an emergency, please don't panic we have highly trained staff who will do that for you") and informative - there are actually still sheep stations along the lake shore that have no road access! Walter Peak is a beautiful spot - pebble beach and beautiful gardens. The trip across the lake took 45 min. That exciting moment had come - the real start of the journey! We quickly changed and hopped on the bikes. 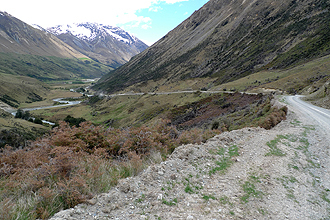 We had chosen this road to South Mavora Lakes and then on to Te Anau as a simpler and more adventurous way to travel south to the Milford Sound and Fiord land Region. 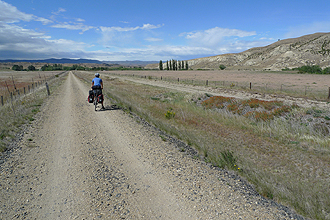 We read about the route in our Lonely Planet Cycling New Zealand Book. It was without a doubt the most beautiful day's riding on the trip. The dirt road takes a slight uphill route and then descends down to the lakes. We set off at 11.15 am. The scenery? Spectacular - great road surface, sheep dotting brilliant green hillside. Sapphire blue lake to see here and there as the track follows the lake at first. Along this stretch another road train came along - going in the same direction so I wasn't worried-the road was wide. But as it past I realized that I would be blinded by the dust - I screeched to a halt which was not ideal. There were a further 2 fords and many cows over the road very curious about us. The countryside was so beautiful - the colours amazing - purples of the heath, white snow capped mountains around, blue sky...gorgeous. 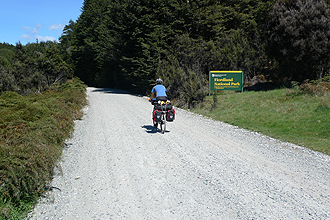 Just before the turn off to South Mavora Lakes, the road became a little more tricky - deep patches of gravel. Boy - in that valley when the sun goes you feel the cold air rushing in! The campsite is about 4-5 km beyond the sign that tells you that you have arrived at the lake. The sites are spaced far apart in little clearings under beautiful trees. We passed the prime site - yes it had a table and benches!! That was taken by a camper van - beautiful aspect over the lake and found a good site further on. There were no other campers. Now for the required bath in the lake. Jeez....cold and then putting on ALL our clothes. Getting into the tent we had our meal and as usual my body temp dropped after the cold swim and I got colder and colder. 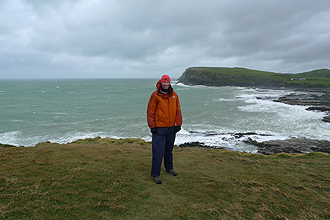 I was eventually in my sleeping bag in all my clothes including Gortex rain jacket and still cold. And getting colder. We then had a warm drink which helped. Oh - I forgot to mention that it was raining -the rain came down as we made camp. When the rain stopped we got out for a bit - it was still a little light out and I soon saw the reason for the drop in temperature - it had snowed - not right at the campsite, but in the hills right there the snow line was noticeable lower than it had been when we had arrived! What a great night's sleep though - one of those places that you don't want to leave - you could spend days there! It's one of the Lord of the Rings filming locations - and it is easy to see why. (1) TSS Earnslaw. (2) Arriving at Walter Peak High Country Farm. (1) Getting on the bikes... (2) The road to Mavora Lakes. (1) Crossing one of the streams. (2) The climb of the day. (1) Open road in the high country. 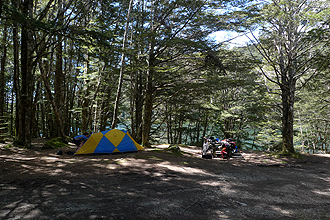 (2) Mavora Lakes campsite. We made a 9.20 am start - not bad! Cold - we wore booties to start. We cycled back the 4 km from the campsite to the turn off to the lake and bid a perfect camping spot a sad goodbye! The ride from there to the bitumen surface was to be a tough 38 km. Not as scenic as the previous day. We made a stop after about 10 km to walk to a swing bridge where there was a geocache to be done. The walk over the bridge took us into a beautiful glade which was part of a bush walk that would loop through national parks the island over. Back on the bikes I had a fall of course over some deep gravel on a descent. As the road twisted slightly from left to right, the gravel tends to bank following with vehicle traffic. So you can't really ride on the side of the road - you need to be in the centre as the cars are. 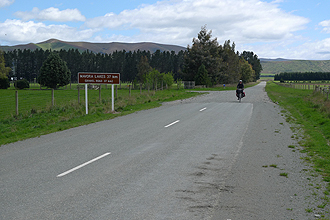 This means that on sections where the road undulates, you can't see what's coming over the next hill...anyway - fortunately it was only 38 km and then we turned onto the road to Te Anau (SH94). We did have a bit of a headwind - but the road was fringed with hedge windbreaks for the farms which certainly helped. We had a rest at a BIG rock with a picnic table - amazing how just when you are thinking "mmm, a picnic spot would be good right now" one appears? That's New Zealand! Passing many flocks of sheep in fields. Seemed that it was lambing season - many had babies and as soon as they hear you coming the babies jump onto their mother's teats - must be a security thing. We saw it the whole trip long. 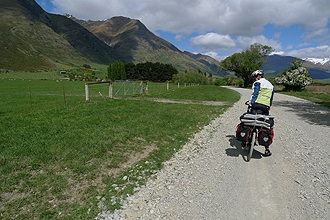 Arriving at Te Anau around the same time as the Tour of Southland (2.30 pm) - an annual cycle tour! Pretty cool! Te Anau is the gateway to the Milford Sound. We had planned a rest day the next day and had thought that we would take a bus tour to the sound, but the weather was windy and the water choppy. We pretty much decided to spend the day in Te Anau - the Sound would always be there! The campsite was really good - the views of distant mountains beautiful. 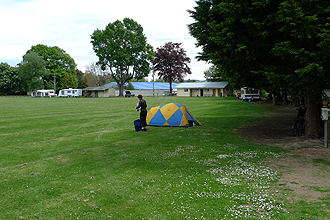 We pitched our tent on the thick grass and explored the town, situated on the shores of the Lake Te Anau - it's a quick walk from the campsite through the main street to the lake - gently lapping on pebble shores. What a treat to spend the next day here! (1) Leaving Mavora Lakes. (2) Stopping at the adjacent river. (1) The end of the gravel road. 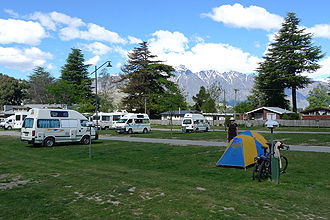 (2) Camping in Te Anau. Well we walked the town flat as usual. We did a few geocache's around. We watched the Tour of Southland head off to Invercargill (knowing we were heading in the same direction). We visited the Botanical Gardens (beautiful Rhododendron gardens) and the Fiord land visitor's centre. After my experience at Mavora Lake I decided that more warm clothing was in order. We both ended up shopping - there were excellent outdoor stores and stockists of wool products. I bought a Icebreaker 320 weight jumper which was brilliant - I will never be cold again...Also - my face was starting to feel like an arctic explorer - so wind exposed - I invested in a tub of moisturiser with merino sheep placenta in there for added ...moisture? Cold start to the day. Didn't inspire actually getting out of bed. Ended up leaving at 8.20 am. It was a fantastic day's riding - a beautiful route. 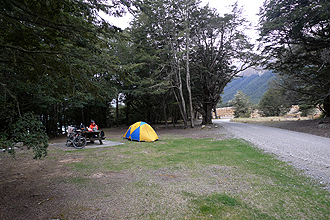 We were quite disappointed that we had not gone on the day before and had a night at Lake Manapouri - it would just have been a 20 km ride - very picturesque. We stopped at a point to do a geocache - and low and behold there was a picnic table right there! 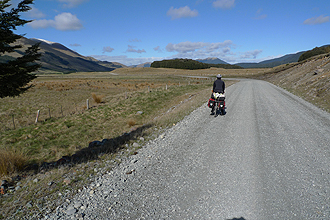 The ride from Te Anau to Lake Manapouri was lovely - all along the lake edges. The view over the Waiau River was very interesting - water is diverted to a hydro-electric power scheme. The Blackmount Hill at 48.28 km is about a 2 km steep climb. Lovely descent and then the turn off to Lake Manawoi at 57 km. It was a 15 km ride to the lake - undulating with a few climbs. 8km of good gravel road to end. The campsite was stunning - there were a couple of fishing boats out on the water. Have never seen sandflies like this! We bathed in the lake. We lay around and read. We went into the tent to escape the sandflies and it sounded like it was raining -there were millions all over the tent jumping up and down! The road we would take from Te Anau and eventually ending in Dunedin was the Southern Scenic Route - taking you from Fiord Land down south and through the Catlins area. 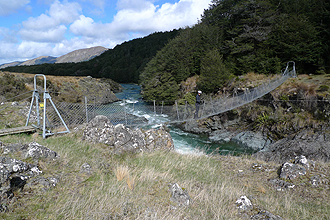 (1) The control gates on the Upper Waiau River. (2) Arriving at Lake Monowai. 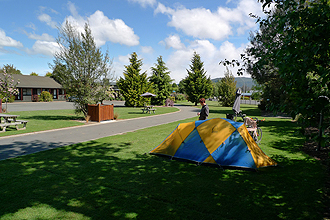 (1) Camping at Lake Monowai. 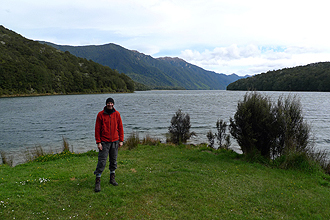 (2) Lake Monowai. We had a 8.35 am start - the gravel road section seemed to go much faster than the previous day! The road to Tuatepere was without incident - except that we had to stop so that I could put on more clothes as I got quite cold. The Clifden Suspension Bridge was a bit of a highlight. We passed many pine plantations and forests on this day. Also saw many sheep again! Tuatepere is the sausage capital of Southland - not sure if this is something to brag about! It is a tiny place. We checked out the Domain Camping Ground - free council camping, but whilst it looked fine, it looked a bit open for our liking. There was another small campsite (Peace St) and then we found a larger one (5 Rivers). We were the only campers - it was beautiful, green and grassy and warm in the sun! The facilities were great - indoor accommodation with kitchen and good ablutions and laundry. We even had a donkey to keep us company which we fed grass through the fence. There was no mistaking it - the further south we went the wilder and more remote it was starting to feel! 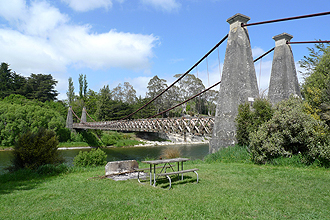 (1) Clifden Suspension Bridge. 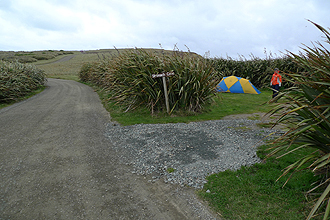 (2) Tuatapere camp site..
We made a 8.35 am start. This seems to be our average start time. There is nothing to rush for - it's not like you have to beat the heat. Today was exciting - all the way to Invercargill. I was looking forward to hearing the Scottish dialect that still survives down this end of New Zealand. The road down to the coast was rolling hills all the way...and many flocks of sheep on the hillsides. The trees that you see everywhere are lying down on their sides. It's a tough place. 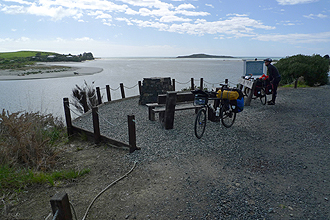 McCracken's Rest was an interesting rest stop - there are direction markers to any towns and islands and the views over Te Waewae Bay were amazing - plenty of rough sea out there - tree strewn beaches. We then passed Colac Bay which is a bit of a holiday town - presumably on that one day a year of good weather! We stopped for Mike to take a picture and a gentleman on a bike came over. Here it was in the flesh - burring away. It was fabulous! I asked about the weather and whether they have lots of snow in winter - he looked at me as if I'd just fallen off the back of a bus. A bit of a climb after Colac Bay and then down to Riverton. We stopped at Riverton around 48 km to have a snack. The weather was grey. That's all I can say about it. On the way into the outskirts of Invercargill, the traffic began to get a little heavier. We were not sure which side of the town we would camp at - the closest campsite on our side was quite far out of town. We passed the turn off and kept going - through the main streets. We went out to the other side of town and camped at Amble On Inn ( we had found out about it online). I was tired by then - we passed a Woolworths's supermarket on the way and remembered it as we would go back there later. The campsite was really cute - again the only campers there. The was a bus route that passed right by and the bus was free all day in the metro area. It was cold and the rain was coming in. We arrived about 2.15 pm. We hopped back on the bikes to head to Woolworth's to buy supplies. (1) McCracken's Rest. (2) Amble on Inn camp site, Invercargill..
We made the most of the free bus service!! We woke to pumping westerlies which made us think about just continuing on our journey (not really....) but we certainly hoped they would still be pumping tomorrow and the next day....We did some laundry! For the first time...and hung it up to dry (?) and then off we went - it was a 5 min walk to the bus stop and we got off in town. The town is quite big and very picturesque - lovely big, serious buildings in the Scottish style - built to last. We were keen to see things to do with the World's Fastest Indian - Burt Munro - who set world land speed motorcycle records on the Salt Water Flats in Utah. A hardware store in town had amazing old motorbikes on display - it was so interesting! We walked all over - to the botanical gardens and golf course which was beautiful. It was very cold and there were not a lot of people around in the streets - it was clear why! We went back to the campsite that afternoon. 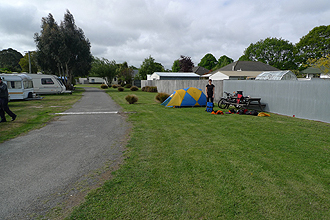 Well - it was a great choice to camp at Amble on Inn because we were on the right side of Invercargill for leaving. We jumped on our bikes and hit the road. And yes - we had the westerly right where we wanted it! There were times when we could free wheel at 30 km per hour! Cold on the bike though. The road to Curio Bay was quite undulating and the closer one got to the coast, the more exposed it became. Between towns there is not much - just rolling green hills. As the road tended more southerly the cross winds became severe - wanting to push your wheels out from under you. Your exposed facial skin just froze off! The tan's we had looked hilarious - just a centimetre between the cuff of your jacket and the start of your gloves on your lower arms and then the area below your sunglasses on your face, but not quite as low as your chin which you tried to keep tucked in as much as possible! The rolling hills had many sharp descents which felt a little hazardous with the crosswinds. Can grass be this thick and green? No wonder the sheep look so happy! We stopped at the info site at Fortrose to get an idea as to road conditions into Curio Bay - wow - you don't want to stop for long in these freezing and windy conditions! The road into Curio Bay is unsealed for about 20 km and in good condition - one long and quite treacherous descent (steep-ish), just when I thought that we would never arrive - suddenly the road levels out and you are there ! Curio Bay! Cute campsite - a little store. Pay for the showers which are hot and that's all that counts! 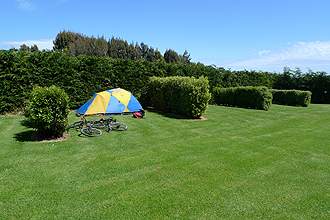 The campsite are little clearings surrounded by bush as without these windbreaks the place would blow away. There are signs everywhere warning of sea lions that sleep in the bush around the tents...There was a lovely undercover picnic table that we dashed to in a break in the weather and ate our lunch. We took a walk to the petrified forest on the beach which is the area's claim to fame and tried not to look at the penguins which are shy and don't like attention...or something. There weren't any anyway. The rain lashed the tent all night. I thought we might have to paddle out. This would be the furthest south that we have ever been in the world! 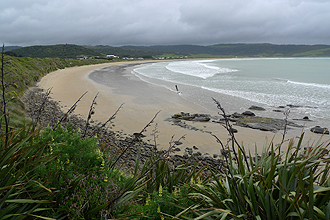 (1) Road to Curio Bay. 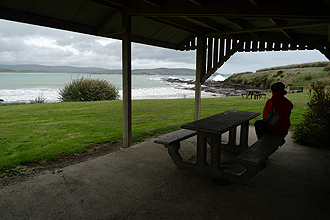 (2) Curio Bay picnic table. (1) Curio Bay. 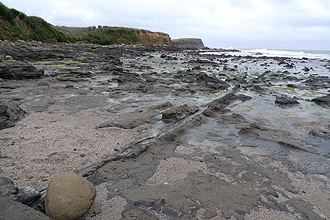 (2) Camping at Curio Bay. (1) Petrified forest. (2) The wind straight from the south pole. Next morning we spent quite a bit of time under the shelter waiting for the rainy squalls to pass. A big friendly seal popped up to say hello! Always a conflict when touring - you wake up in your warm sleeping bag and comfy tent to the sound of wind and rain and wish that you could just stay there for the day! But you've got to move on - and it always sounds worse than it is! First stop today - a geocache at the local post office at Waikawa! And then onwards - those rolling hills! The Catlins Forest Park is very beautiful to cycle through - green and leafy. We stopped for a geocache at some old mine works and kept going. It was still cold - but no rain! The roads were very quiet. The climb up Florence Hill was quite tough but the views from the top made it all worthwhile. Papatowai is at the bottom of a long descent and then there is the climb up the other side which thankfully was sealed, although we had expected otherwise. Just before the final decent to Owaka - we stopped for a geocache behind an old wagon wheel. You would not believe the wind up there! Hopping on the bike to descend the hill, I could barely steady my bike. The road just dropped away and then followed the lake edge down to Owaka. We stopped at the info site/library to find out about camping - behind the pub. What a gorgeous spot! We went to buy supplies at the local 4 Square and did a geocache in town. It was a cute place - cold! The campsite of our dreams. It appeared to be the back garden of the pub - but also some old man's house who waved at us out the window. I wouldn't go out either if I were him! (1) View over Oyster Bay. (2) Camping in Owaka. Short day today - but tough! Leaving Owaka, the first thing that happened was we dropped down and then started climbing, up and up.....quite tough. And cold. Mike went on ahead as he often does on hills and I would expect to meet up with him a few km's on when he pulls off to look at something interesting...I came upon a reserve of sorts with plenty of cars about and people too and had a look as I passed - I didn't want to stop as getting going on these hills is not a pleasant prospect. I had a look for him, but couldn't see him. I kept going but suddenly thought - did I look well enough? Where is he? He wouldn't be this far surely? Suddenly I came upon him - by this stage I was feeling a little worried -and stuff which looked suspiciously like snow was materialising n the air...anyway! I was happy that we were back together! He was freezing as he had to wait! Next stop - Balclutha - I was excited as I thought there may be a second hand bookstore and my book was long since finished - always make sure I collect tourism brochures EVERYWHERE as backup! The road into Balclutha was busy and the road out was steep and busy! We stopped at a beautiful park on the way in tried to find a geocache which we could not locate - lovely rhododendron bushes. The road continued much the same to Milton. Not as remote as the way through the Catlins Reserve. We were happy to arrive - of course looked for a bookstore - there was one but it had closed. 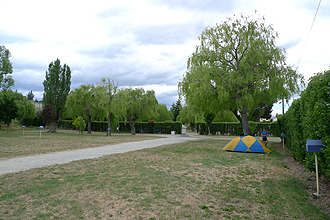 The camping ground was on the other side of town along the main street - at the domain - beautiful spot - very open - some permanents which is always good as they are house proud. Man, you'd have to be tough to live in a caravan on the South Island! Pitched our tent miles from anyone and took a walk into town to ...yes you guessed it - buy something to eat! They had these amazing HUGE muffin/cake type things for about $1.50 that we would buy whenever we found them - yum!! We were lulled to sleep by the thundering of milk trucks transporting their white treasure all over the country. They were to be seen very regularly from now on. Yay - bright lights, big city here we come! 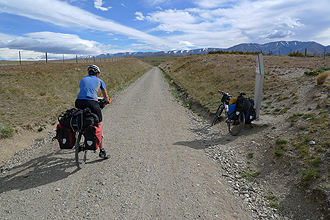 At this stage our plan was still to continue from Dunedin north back up to Christchurch via Omarama and Lake Tekapo. The day today was good. About 16 km from Milton at Waihola there is a farm with hundreds of shoes tied to the fence. Curious cows watched me as I found a geocache in one of them! 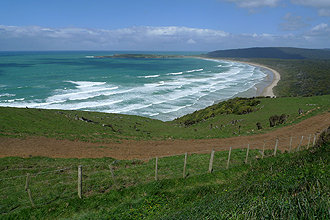 Shortly after Waihola there is the turn off to Taieri Mouth. I was a little apprehensive as I knew there was a steep climb to come. Mike led the charge and I said "See ya at the top". It was a 6 km steep climb - the funny thing about cycle touring is that you (well I) will only average about 7-8 km per hour on a climb like this with all the gear on the bike, so you're looking at 45 min ride to the top! Excellent views and picnic table at the top! Mike actually joked and said- "Yes - the climb carries on for a little way further". Actually - he surprised himself - he was right!!! The road levelled out for a few km's and then climbed again! Damn. And then the LONG descent! Beautiful! Right down to Taieri Rover Mouth on the other side. We sat a rested a while and had a snack on the boardwalk and then got ready to go again. 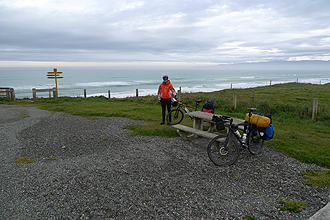 The road to Dunedin follows the coast - I remember thinking at that stage that we were not even halfway - we still had 36 km to go! Straight into a headwind. Then the rain started. More headwind. Traffic busied up also along this stretch of coastal road. I remember thinking that if it wasn't for the headwind and the rain and the cold and the TRAFFIC the views would be lovely over the sea. As we neared Dunedin Mike did his expert navigation of streets using the GPS maps. There was a bit of climbing involved - not bad though. Then - we came upon this stretch of road - I thought it was an optical illusion - the bitumen just rose and rose and rose. I didn't know a road could look that straight and that steep. We just kept pedalling. It got really steep. At the top we had a rest - Mike actually used bad language. We had more pelting rain and then off we went. The GPS batteries went flat. Mmm. Now what? At this stage of the day you don't need hassles getting to your campsite. Luckily just then we were in the suburbs and came upon a cafe. Mike went in and procured the batteries. We were off again. Coming down into Dunedin the streets are impossibly steep - which means you really don't want to take a wrong turn and have to climb back up any of them! Very pretty town from first impressions. 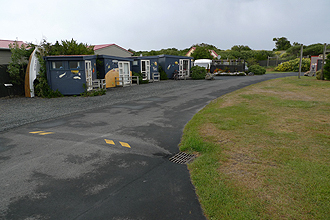 Suddenly, we were on the correct street to the campsite - it was Dunedin Holiday Park at St Claire beach. As we came trundling down the main street the hail hit and by the time we arrived we were well and truly over the day. We stood dripping in the reception, to the (slight) dismay of the management. Mike looked up at the accommodation board and said - "How much is a cabin? 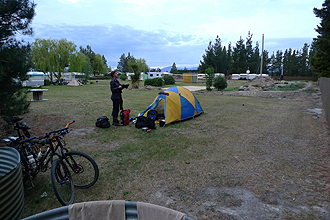 "($44 per night) - it was not much more than a campsite and we were sold. The thing was that they were only available after a certain time - 2pm or something. So we schlepped all our stuff to the passageway outside the ablutions- it is a very well-organised campsite and unloaded wet panniers, located our clothes, towels, soap etc and had a hot, hot shower. Then our little cabin was ready - only big enough really for the bed it held and luxury of luxuries - a kettle and electric light!! (See how happy I look in the picture - guess it doesn't take much). 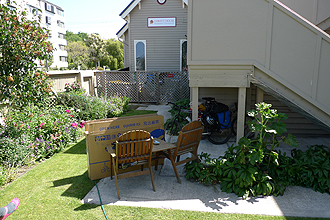 We had a little porch as well and of course it took ages to sort out our stuff - wet hanging out to dry (?) - stinky stuff had to go outside etc. We got some sunshine then and took a walk to the nearby supermarket - well it was about 1.5 km away. We shopped up a storm and then ate in the camp kitchen. I used the laundry - second wash of the trip! And then thought with the wind and the sun I'd buy some pegs and hang it up to dry on the washing lines. It took ages - I was cold and tired and there were so many things....I then went back to the cabin to get something to take to the kitchen - in the space of 5 min everything had blown off the line - pegs, clothes the lot!!! I was so annoyed. Anyway, most of the stuff could be hung around our room to dry. (1) Taieri Mouth. (2) Our small cabin at Dunedin Holiday Park. 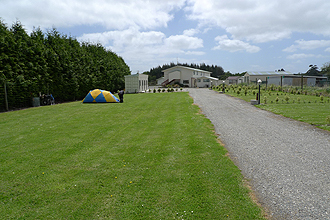 (1) Camping at Dunedin Holiday Park. 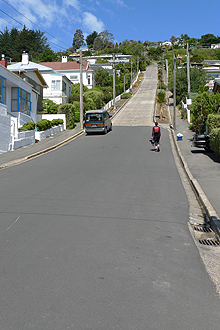 (2) Steepest street in the world - Baldwin Street. (1) Dunedin Station. 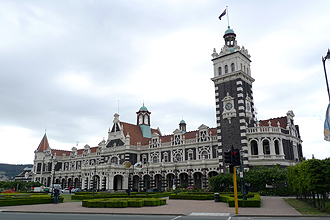 (2) Dunedin Station. We had a strange night's sleep as you often do in a bed (with a pillow)and the next morning our plan was to relax in bed, take our time and exploit every minute until 10 am chuck out time. We booked a campsite for the night and stuck/stuffed/hung what we could from the bikes and schlepped over to the campsites., walking with our sleeping bags wrapped around our shoulders. We had a late breakfast, pitched the tent and caught the bus from just outside the campsite to town. We then spent the day in Dunedin - a very pretty and hilly place! Beautiful botanical gardens and lovely buildings. We did some geocaching and experienced another hail storm! We discovered an amazing ice creamery and went back for more the next day. We walked back to the campsite from the ice creamery with our purchases wrapped in newspaper and of course they were still frozen when we arrived! We spent time at the botanical gardens - spectacular. All the gardens had rhododendron bushes flowering - they were enormous. Just so different being in a cold climate, high rainfall area. 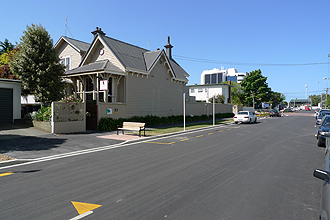 We stayed in Dunedin again another day and walked back into town and up the world's steepest street (Baldwin St). It is certainly very steep. 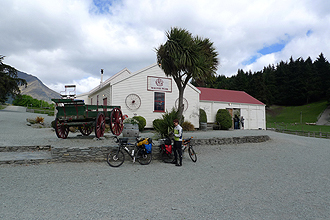 We had also decided to change our route and do the Otago Rail Trail back to Cromwell instead of continuing back up the coast to Christchurch. It would mean a shorter trip overall but you sometimes get to a point on these trips where you don't really want to be on the road anymore and the thought of a dedicated route for cyclists suddenly seemed attractive and quite novel. We had actually wanted to do the rail trail when we were planning our route but then decided against it, so maybe it was meant to be to do it in the end? The trail is about 180 km long and as the name suggests, follows an old rail route. They pulled up the tracks and the path just goes along where the tracks used to be. It starts at Pukerangi and we caught the original locomotive from Dunedin Station to Pukerangi. 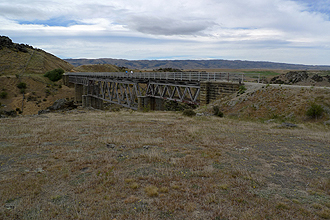 It is called the Taieri Gorge Railway. It is diesel powered now but in its heyday it was steam driven. So we booked in on our second day in Dunedin. 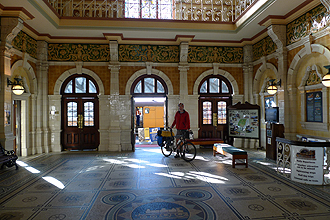 The Station at Dunedin is world famous- it really is spectacularly beautiful - the interior completely tiled in hand crafter Royal Doulton porcelain. It's amazing. Feeling like a holiday now! We biked in to the station which took no time at all and then boarded the train. There is a running commentary all the way from the driver which was interesting. 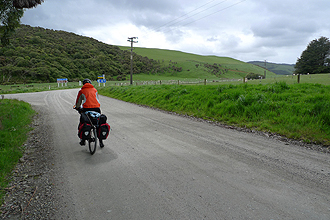 The route out of Dunedin is certainly very steep by road so we were pleased not to be biking. We spotted "The House of Pain" out the train window. The railway was built entirely by manpower - no mechanised tools - tunnels cut out of the rock by pick and shovel. The tunnels are just big enough for the train to pass trough. It was amazing going over the viaducts - the track seems to go out into nowhere along the tiny track - beautiful engineering in the stone bridges. The train stops at a few of the stations along the way - or rather sidings - just spots along the way. 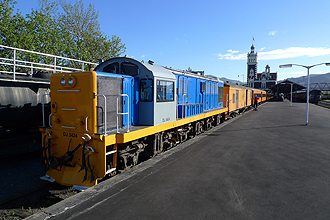 Most people do the trip as a day trip - the train goes as far as Pukerangi and then the locomotive is unhitched and attached to the other end and the train is taken back to Dunedin. Pukerangi is not anything really - there are two houses and that's it. Real sheep country. Very very beautiful. The other travellers watched with interest as our bikes were unloaded and then the train went leisurely on its way. It was an amazing feeling being left being - very peaceful and serene. We sat down at some benches and brewed up some coffee and savoured the peace and quiet. It was only a short distance to Middlemarch. We passed other cyclists on the way who seemed to have been cycling about 15 km a day but having a great time - there is so much history on the way. Little maintenance huts have been changed into info stations - it is lovely! The views were just beautiful. Clear country air! Middlemarch had a lovely camp site - no shops that I recall - or perhaps when we got to the shop it had closed. But we had enough provisions. There is a station at Middlemarch - it's quite strange as the station building is beautifully restored but no train will ever come there again. For the Rail Trail, you can buy a booklet (or Passport as they call it) to stamp along the way at all the stopping points to map your route. 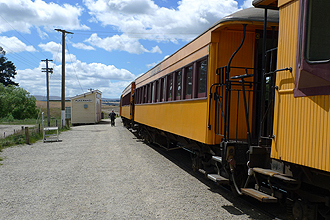 (1) Taieri Gorge Train. (2) Pukerangi Station. 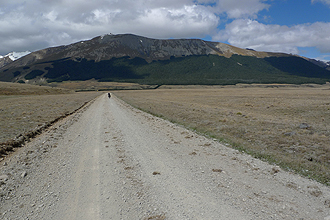 (1) Road from pukerangi to Middlemarch. 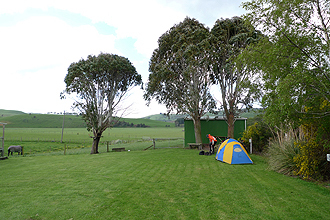 (2) Camping in Middlemarch. Off on the trail again! Obviously the good thing about a rail trail is that it has no steep climbs - but the constant grades do sometimes wear you down - and narrow in parts. But so beautifully organised and if you enjoy that sort of thing there is no end to the stops you can make to read info boards about the history of the area - particularly the story of building the railway. You really develop an understanding of the way that the railway opened up the area and provided people with access to the outside world. Towns spring up fed by the demands of the railway and it was a tremendous change for these people when it ceased operating and they were cut off once again. We went through the first long tunnel of the trip - you get off your bike as you can't see anything!!!! We did come across quite a few cyclists (mostly out for a day-ride). Ranfurley has the most amazing art deco style architecture. The rail station is like a museum - really lovely. The campsite at Ranfurley was also nice. Quite hot there. We met two German cycle tourists there. 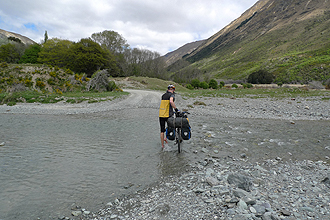 We were thinking of cutting across via a dirt road to the main route to Omarama, but they soon put us off that idea - this was the route they had taken to Ranfurley and was unrideable in sections. 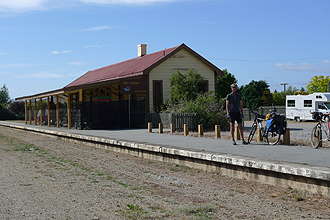 (1) Rail Trail to Ranfurly. 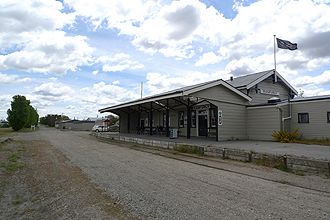 (2) Ranfurly Station. My goodness, we woke up to the head wind from hell. What could we do but set off. It was terrible- really bad. Right into the teeth of it. We weren't hitting 10 km per hour along the dead flat. We stopped for a rest at the first settlement we came across. When we met the German guys later at Omakau they said they had a beer and sleep there! We just kept going - what can you do? It was still picturesque etc , but boy did I want it to be over. 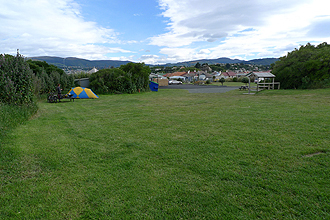 Nice campsite in Omakau. One interesting thing about the trail. The original wooden bridges are still in use. After each bridge there was a large concrete cylinder - looked quite new but had been there since the railway was built. They would be filled with water as often sparks from the coal fire would jump out and want to burn the bridges down - must be where the expression comes from. 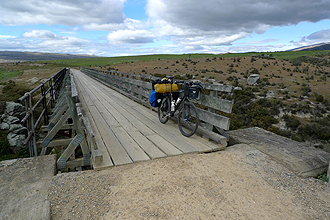 (1) Highest Point of Central Otago Rail Trail. (2) Another Bridge. Short day today! Alex is a bit of a town and has a huge campsite and big supermarkets. We decided that we would get the bus from Cromwell to Christchurch and booked it at the info centre. (1) The Rail Trail. (2) Camping in Alexandra. Another short day! Pretty road. 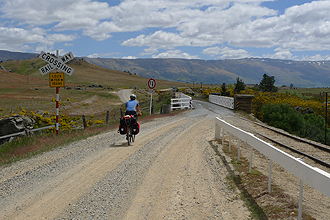 The rail trail itself ends at Clyde, but we were to continue the short distance to Cromwell. We camped at the same place we had camped at Cromwell three years ago. The fruit flow (ice cream and berries all mushed up in a cone) was still working at the fruit stall and was delicious!! We relaxed, did washing and then caught the bus back to Christchurch the next day. It was not the best experience - the bus or shuttle was very late as for some inexplicable reason it had waited for people who were running late in Queenstown - and thereby disadvantaged everyone else. Then we sat across from an American girl and her travelling companion who was South American and who (the girl) spoke the ENTIRE way - and I mean without a rest - and the trip took hours and hours. It was sort of bitter sweet as we had planned to ride it and the road was amazing - but very steep in places often with no shoulder. Still. I think Mike wants to go back to ride the road unridden! Then when we arrived at Christchurch in the dark at about 10 pm - our bikes that had been tossed in the back trailer (despite having told them that we had bikes and a bike rack was in order) were joined together at the pedal and spokes, which bent Mike's chainring and my tyre was punctured so we could not ride them to the campsite - just had to pack everything on and walk them which was about 5 km. We were asleep on our feet! (1) Clyde Station (end of the line). 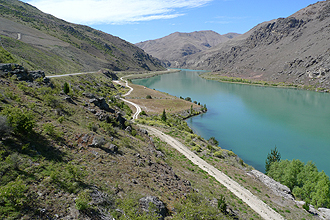 (2) Lake Dunstan, between Clyde & Cromwell. 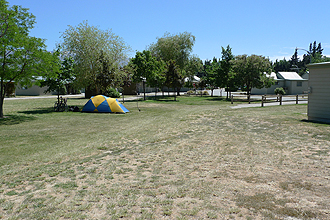 (1) Camping in Cromwell. (2) View from Old Cromwell Town. 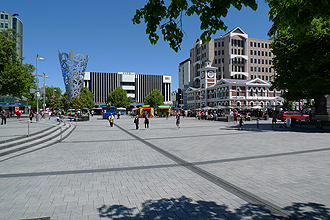 We had two days in Christchurch and walked it flat - did many geocaches and had a good time. The botanical gardens were lovely as well. We spent the last night at Dorset House, a youth hostel type accommodation, as we had a very early flight the next day. As well as being the best hostel we have ever stayed at, it was convenient as we could pick up bike boxes at a bike shop and then pack the bikes the night before. (1) Cristchurch Cathedral Square. 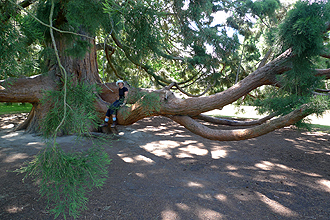 (2) A big tree in the Botanic Gardens. (1) Dorset House. (2) Packing the bikes at Dorset House.